HH food stock will be sufficient for more than 4 months from the stock of previous harvest and good purchasing capacity. 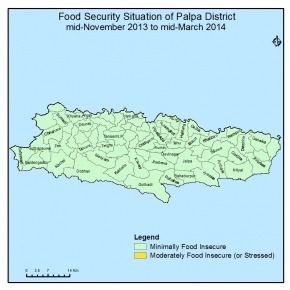 Cash crop (orange/ vegetable) and livestock products sell will be continued. Similarly there will be income from remittance and employment opportunity will also be available from development activities. Market price of main staples in key markets may remain stable due to good road access and availability of food from summer harvested crop. Market stock will be sufficient and civil security will be normal due to completion of Constitutional election. People will use their traditional mechanism as wage, sell of cash crops ,out migration.